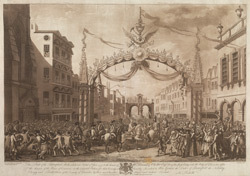 View of a crowded procession through the Triumphal Arch in the City of Gloucester. This arch was erected in 17th June 1777 for the entry of William Bromley Chester Esq., after his win in the parliamentary election. His election was contested by George Cranfield Berkeley. The street is crowded with people and the windows of nearby buildings are clogged up with spectators. Bromley Chester is in the centre of the picture under the triumph arch on a horse. Guards are trying to contain the crowds and some unfortunate spectators have fallen over. The arch is decorated with garlands, foliage, tassels, material and heraldry.